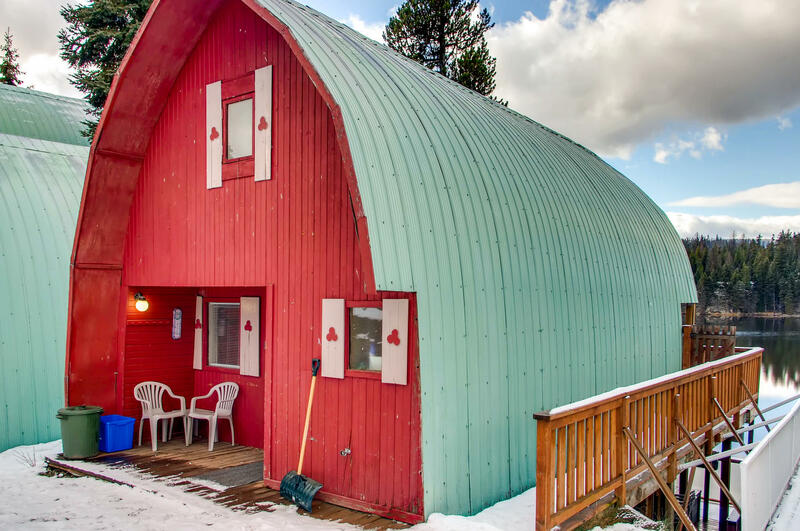 This cottage will have you charmed from the moment you pull up. Once you step inside and discover some of the quirky decor and homely touches, you won’t want to leave. The varnished wood floors and wood panelled walls help add to the cosy feel. You enter into the combined living, dining and kitchen area on the lower level of the property. There is a round dining table that seats four, which is a great spot for intimate family dinners or an intense board game. The kitchen has a fridge/freezer, microwave, sink and benchtop built into the corner and a freestanding electric oven with four burners. Be sure to check out the day’s catch above the microwave! The bathroom is near the entry and has a step-up toilet and shower, corner vanity and shelving for storage. The lounge area offers a comfy 3 seat sofa which folds out into a bed, as well as two single armchairs, one of which sits right by the large window that provides views of the lake. There’s a small flatscreen TV, DVD and VCR player and a cabinet well-stocked with DVD’s, books and board games like Scrabble and Pictionary. You can also curl up by the small electric fireplace on those colder nights, make some popcorn and watch a DVD or read a book. In the warmer months have a wine on the deck while you’re cooking dinner on the BBQ and watching the world (or the wilderness) go by. 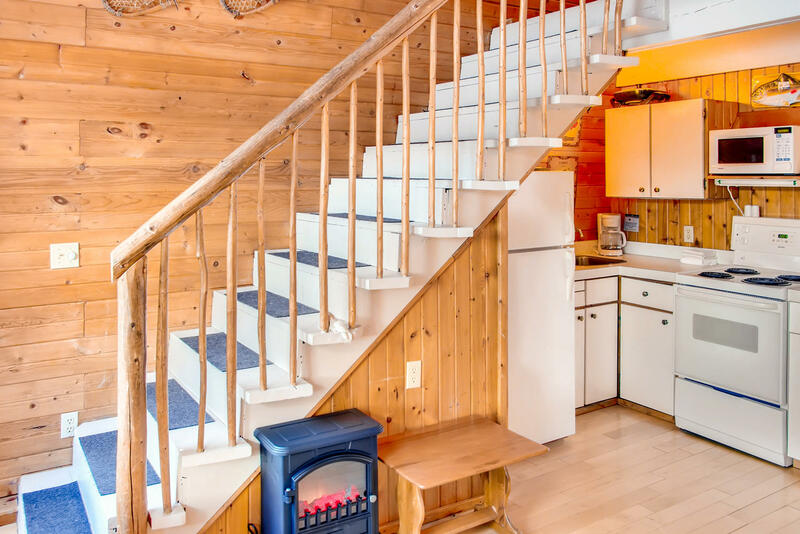 A set of stairs from the deck leads down to a semi-private dock, so you can easily dangle a line in and try to catch your dinner if that takes your fancy! A natural wood banister leads up to the loft, where you’ll find two double beds, as well as a single, providing plenty of sleeping space for a small family. A high window gives the loft elevated water views so you get to wake up to an idyllic outlook each morning! There are two bedside drawers to store away your belongings and a ceiling fans to help make you more comfortable in summer. The property also has free access to Boats at the resort on a first come, first serve basis. Any guest can help themselves to the oars, life-jackets and the boats.There is a total of 6 - 14ft row boats and 4 - 16ft canoes. Reviewed December 7, 2018 by Unknown of West Kelowna, BC United States. Updated on December 19, 2018. Review of stay from December 3, 2018 to December 5, 2018. Excellent rental experience. A great little cabin for a get away for my wife and I.
Hi Rudi, We're so glad to hear you loved the property and had a wonderful getaway! Did you have a chance to make use of the private dock at all, or was it a bit to chilly at this time of year? We hope to see you back for another getaway soon! - Kelli. Reviewed January 9, 2018 by Unknown of Kelowna, BC United States. Updated on August 30, 2018. Review of stay from January 5, 2018 to January 7, 2018.
the Cottage was spacious and had everything we needed, beautiful deck that has a walkway down to the lake. 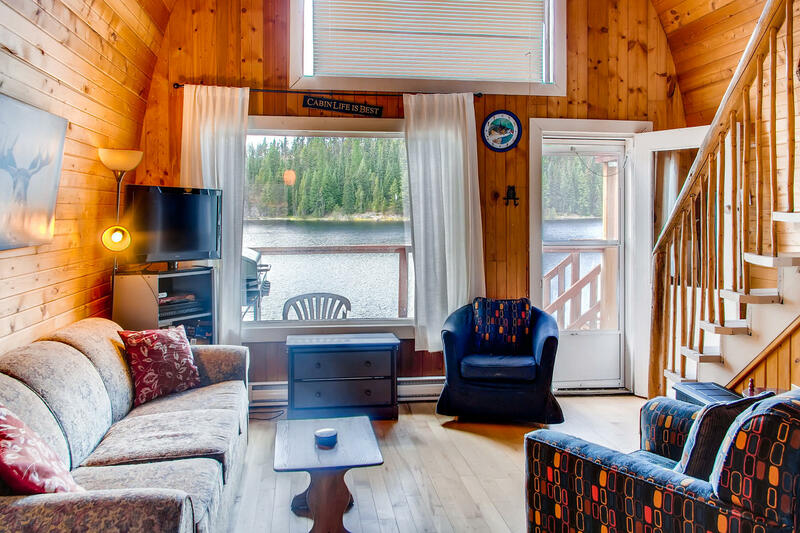 We are pleased to hear you had everything you needed at this remote lake getaway and that you were able to experience the beauty the property has to offer right from the deck. Reviewed June 6, 2018 by Michael O. of Calgary, AB Canada. Updated on August 27, 2018. Review of stay from May 28, 2018 to May 30, 2018. We are glad to see you enjoyed your stayed at Idabel lake! We hope to see you back. Reviewed January 31, 2017 by caitlin l. of Oliver, BC United States. Updated on February 12, 2017. Review of stay from January 27, 2017 to January 29, 2017. Booking was a breeze, and questions were answered promptly, so before we even got to our rentals, the experience was good! 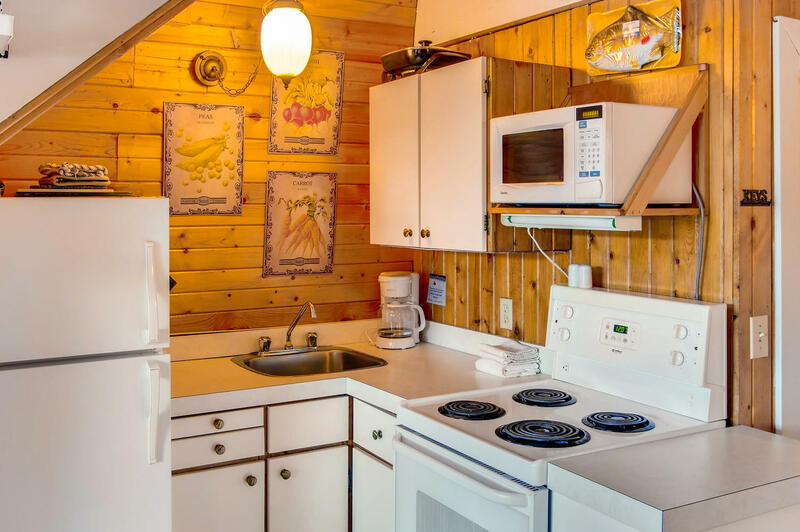 The cabins (Nature's A'lure, and The Boondock) were very clean, cozy, warm, had kitchens and bathrooms that had everything we needed, they were well stocked with games, movies, music etc, and had breathtaking views of the lake. There was great places to snowmobile all around the area as well! All 12 of us have come away from put weekend away excited to come back in the spring, summer, and fall. Great experience, highly recommended! Thanks for taking the time to review your stay with us at Idabel Lake. We're so glad both cottages suited your group and you were able to have a great time exploring the beautiful area around the lake by snowmobile. We'd love to welcome you back to stay with us again at Idabel Lake! Reviewed September 8, 2017 by Jessica U. of Calgary, AB United States. Updated on September 12, 2017. Review of stay from August 16, 2017 to August 23, 2017. Reviewed August 15, 2018 by Unknown of Clipston, Northamptonshire United States. Updated on August 26, 2018. Review of stay from August 2, 2018 to August 7, 2018. We came over from the UK for a Canadian Experience and Idabel Lake really helped provide that. The cottage was basic, yes, but had everything you needed for a real getaway. The cottage was basic (in a good way I would say) but had everything we needed and wanted. Perhaps a couple more games? It was clean and easy to use (although we never did find out how to get the TV to work - but we didn't ask anyone as having a break from the screen was lovely). There was no way to lock the back/balcony door, so although there is an effective keypad on the main door, you could just walk in anyway! A new net, balls and bats for the ping pong table would be a bonus. We are so glad you got to enjoy a peaceful and relaxing Canadian experience. It really makes for a nice trip when the weather is great and the animals are out. Thank you for your suggestions about the games room, as well as informing us about the locks. We will look into this to make sure our properties are secure. Reviewed June 7, 2018 by Breann K. of Lake Country, BC Canada. Updated on August 27, 2018. Review of stay from June 1, 2018 to June 3, 2018. I LOVED this place!! We rented two cabins for a girls weekend and we were all extremely happy with what we got! The deck overlooking the back was where we spent most of our time (it fit 8 of us with lots of room). The beds are on the small size so just be aware of this, but for a weekend it’s not a big deal!! The lake is amazing!! Sooooo much to do at this place : badminton, campfire (free wood) a pirate ship that kids can play around in the water, hiking, games room, and so much more. I can’t believe there are not more people here. This place is amazing!! The cabin was well stalked and super clean. We will for sure be booking again. Just a gem! We are so glad to hear you enjoyed your stay with us at Idabel Lake. it is a perfect location for a relaxing and tranquil getaway. The views of the Lake off the deck are stunning and we are so glad you got to experience this with all your guests. We look forward to seeing you here again soon. Reviewed May 2, 2017 by Unknown of Kelowna Southwest, BC United States. Updated on May 10, 2017. Review of stay from April 28, 2017 to April 30, 2017. Cabin was cozy and warm. Overpriced though. And who charges 125 for cleaning fee. I would expect it to be spotless for that charge, which it was not . Hair and old chips on the floor . Could have done it better myself... for 20 $ . Reviewed February 15, 2018 by Unknown of Kelowna, BC United States. Updated on August 27, 2018. Review of stay from February 8, 2018 to February 11, 2018. Beautiful lake. Games room fun. Cottage nice, but small for 7 people. Main problem was no staff on site for issues, such as door code not working (probably cold batteries), no toilet paper in games room, etc. We are glad you were able to enjoy your stay. We are sorry you had issues with the door code and that you were unable to get in contact with the caretaker. There is a phone located in the games room where you can feel free to call us directly and we would be happy to assist you with your needs. We would love to have you back in the future and if you need any assistance please let us know. Reviewed January 11, 2017 by Nilesh P. of , United States. Updated on January 16, 2017. Review of stay from January 7, 2017 to January 9, 2017.
washroom drainage pipe was not working. water was stuck over their. please fix that. Thanks for taking the time to review your stay with us at Idabel Lake. Unfortunately with the unusually cold temperatures we've been experiencing this Winter we have been experiencing some problems with pipes freezing and we're doing our best to ensure this doesn't continue to happen. We're glad you enjoyed the other aspects of your stay and hope to welcome you back to stunning Idabel Lake again in the future. Reviewed February 1, 2017 by Howie M. of West Kelowna, BC United States. Updated on October 18, 2017. Review of stay from January 13, 2017 to January 16, 2017.